Simulation games are one of the more exhaustive types of Role-playing games, if only because they require the ability to grasp and execute multiple mechanics and concepts simultaneously and early on. If you misjudge a strategic estimation, you may end up paying for it in the long run. Therefore, it’s crucial that any simulation game firmly establishes its roots before letting the player off the hook. This is important, of course, only if they have a great number of systems. If this is the case, then a game probably shouldn’t soft-lock during its tutorial. 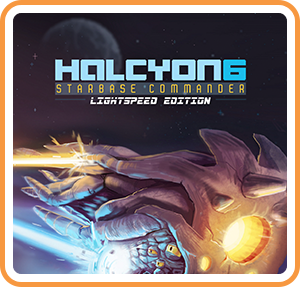 Halcyon 6 is a space simulation game where the player assumes the role of commanding officer on the titular space station. After the eldritch Chruul wipe out your most powerful ships with ease and raze the New Terran Federation, your crew aboard the derelict Halcyon 6 must maintain a stable foothold in what is now a very unstable galaxy. In order to do this, you’ll need to manage your space station, the safety of the planets in your system, and the unsteady alliances with other factions throughout the galaxy. These three elements each have their own layers of depth, mostly revolving around the same resources, so it’s up to you to micromanage your way to victory. Crew members can be sourced from colonies, dark matter can be drawn from arcane facilities, materials from asteroid fields, and fuel from nebulae. All of these are needed to craft spaceships, develop technology on board the Halcyon 6, or improve the productivity of all the other systems. However, you’ll need to either perform shipments by sending out your own officer-crewed vessels to cart them back and forth, or automate them through the development of delivery drones, a costly tech tree on your space station. This is just one of the few early-game decisions you’ll need to make, and whether or not you’ll be on the offensive against the Chruul will matter a great deal. 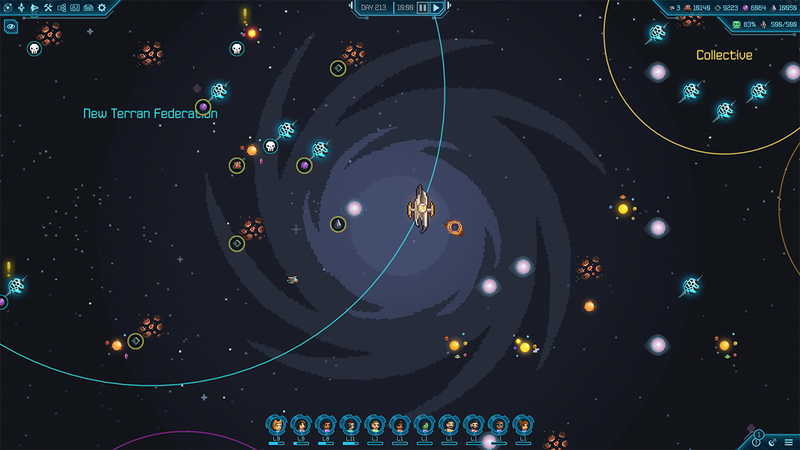 Halcyon 6 has an extremely extensive ecosystem of gameplay elements, from establishing trade routes and base-building, to both space and ground turn-based battle systems. 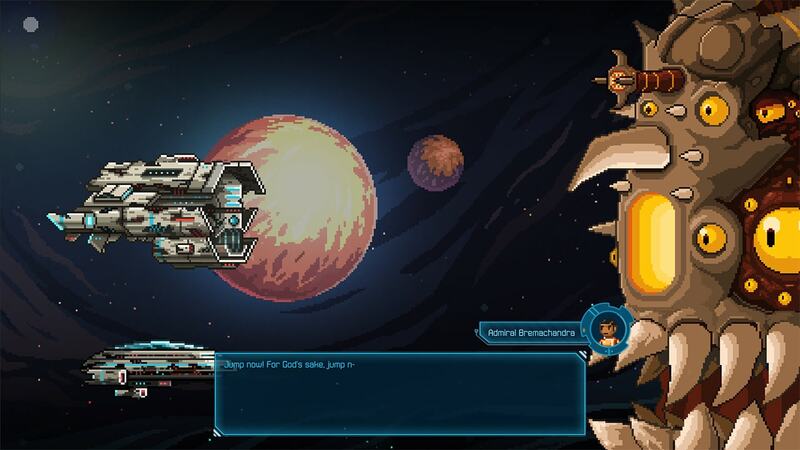 Space battles against the Chruul and other forces of the Space Pirate, Space Merchant, and Space Robot variety take place over planets, with each ship acting separately by selecting from a variety of attack abilities that operate on turn cooldowns. 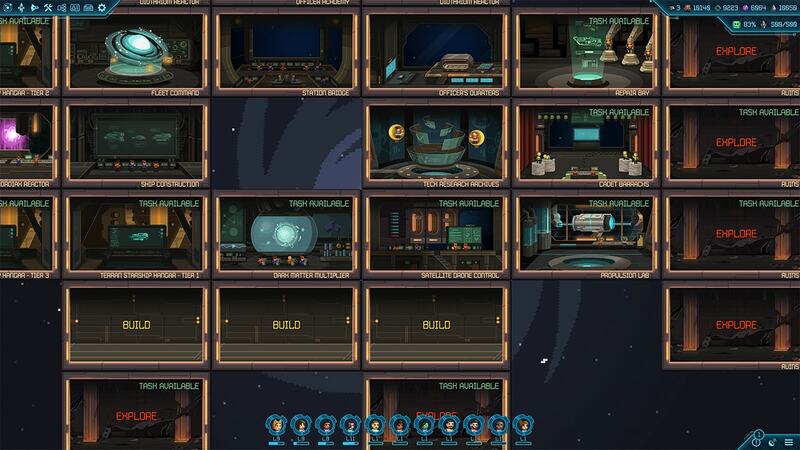 The game’s primary method of varying ship function and depth are its seven different status afflictions. Each ship possesses varying resistances, and certain attacks will inflict status as well as exploit them for additional damage. Exploits work as follows: if you attack an enemy with a status affliction, you can simultaneously bestow another while wiping the previous clean for extra punch. Keep in mind, this is atop the ship – and Officer – exclusive status effects and abilities. Although ground-based battles happen infrequently in the early moments of the game, they will escalate as the plot progresses squadrons of two “green shirt” Cadets will engage in enemies, lead by their commanding Officer. During these battles, there are a set of seven unique, yet essentially similar status effects that ground units can perform upon enemies. Officers are a hugely important resource in Halcyon 6, as they can perform essential tasks on the space station and also command each space vessel. Recruiting Officers is a resource-intensive process, but it also relies on preexisting Officer experience – if you want to have four Officers, you’d better have at least one of your previous three at a certain level. Officers can come in three categories, able to pilot one of the three ship classes, although there are two titles per category and categories have two sub-classes. If you think that sentence was hard to follow, yes. You are right. Officers have their own individual skill trees, Cadets can be upgraded through Halcyon 6’s facilities, ships advance through several stages of classes and can only be piloted by increasingly experienced Officers, who in turn can be recruited at higher levels through investing in certain facility upgrades. The Space Station must be powered and needs a certain amount of reactors in order to function. Its own structure can be reinforced in case of enemy attack, and one can micromanage the morale of their troops by running propaganda campaigns through facilities. Yes, there’s plenty to do in Halcyon 6, and because of its hourly and daily scheduling of events and real-time space travel, managing all of these elements might seem a bit too overwhelming. Except, the game actually pulls it off. By pressing the plus button on your controller of choice, you can freeze time at any point (unless you’re in combat) in order to review your options. If some unexpected event should occur on your timeline, you can check your notifications and react to it, even canceling a great deal of the facility processes your Officers are performing (resulting in a loss of resources, though this can be a necessary sacrifice). The result is a game that feels like an immense amount of decision making during a single play-session despite giving the player plenty of time to think things over. The scenario established at the start of the previous section is precisely how complicated Halcyon 6 wants to get with its narrative. All of the beats are fairly standard, existing only to get the player from one tech tree to the next. The game’s various alien races – as vibrant as they might be – all possess dialogue centered around a handful of their specific characteristics. The Space Robots are cheerily cheeky, the Space Merchants are fast-talking and profit-oriented, and the Space Pirates are cutthroat backstabbers. Their individual micro-narratives play out much as you’d expect they would. This isn’t to say that the scenario dialogue isn’t both charming and funny, however. The game’s writing is very oddball, with characters acting extremely dense in the most enjoyable way possible. 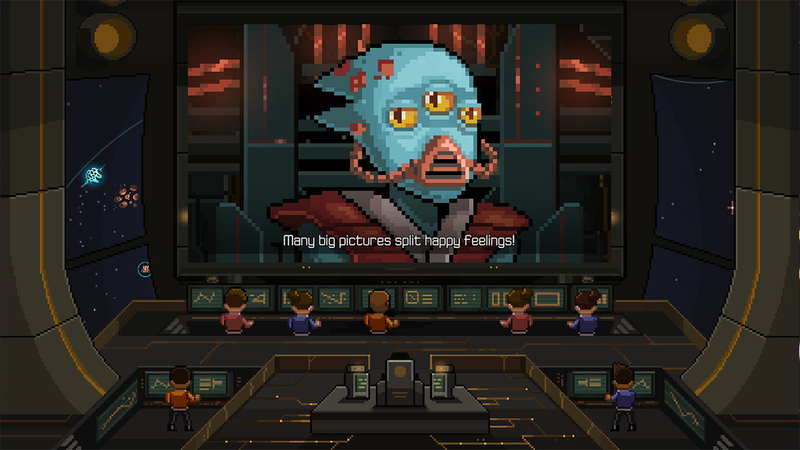 The player is given a variety of options in order to sort out diplomatic issues, as well – as long as everyone is worried about the Chruul, you can use this fear to your advantage, or attempt to subjugate all other denizens in the galaxy. There are several randomized instances that are extremely amusing, involving matter replicators, dark cults, and super soldier serums. Halcyon 6 may be a complex game, but its visuals are bright and simplistic, allowing for easy identification of information. The game’s pixel art is based around utilizing distinctive shapes in order to convey a variety of details. Your Officers will usually be grouped with their vessel type, so seeing the ship models will help the player recall each unit’s role. That being said, the ships possess the majority of the character in the game, with some neat designs that draw upon all sorts of science fiction material as well as offering some unique twists. All the factions in the game possess their own unique ship designs, complicating as they go up their tiers, and covering each of the three vessel types. The sprite work also highlights the amusing character design, with ground battles showing off some impressive enemy biology and all the alien types given loads of personality. The characters aren’t the only thing that are a joy to look at, either – all of the game’s menus are very clean, and its backgrounds are both pleasing to look at and pulsing with subtle signs of life, whether its arcs of lightning across the surface of the planet or the writhing of a Chruul Spire’s interior. With all of this praise towards the systems and visuals, one might wonder why Halcyon 6 received such a foreboding introduction. Despite its impressive and enjoyable gameplay, there are some issues regarding performance that hold the game back a bit. With such a lengthy list of mechanics, it would be great if the tutorial wouldn’t soft lock after encouraging the player to enter the submenus for various functions. While this might seem like I was asking for trouble, it occurred in three different parts of the tutorial, leading me to have to restart the whole thing. Likewise, the game’s turn-based nature could make it the ideal candidate for the Switch’s handheld mode, but you cannot reset controller options within the game, meaning you’ll have to close out the title and re-open it with a new controller if you want to play it in a different configuration. The in-game cursor is accurate enough, but its movement speed cannot be modified, which can lead to some tedious trips across the screen in order to press certain buttons. To top it all off, the game seems to be lacking in optimization, as just about every screen transition triggered by a button input is accompanied by a healthy dose of lag. There is one particularly infamous aspect of Halcyon 6 that dates back to its original classic form, which is the nature of one of its final skirmishes. Simply put, the game warns you of an impending battle about twenty in-game days in advance, and then springs a surprising and completely unreadable four additional skirmishes out that have mandatory completion once the battle begins. 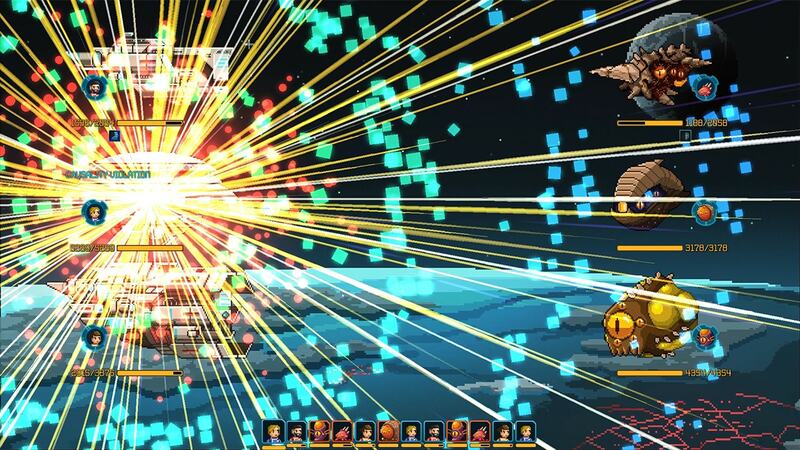 This is a difficulty spike of insane proportions, as no other battle has been structured as such previously and the final ship will simply tear the Halcyon 6 apart as the player scrambles to take out the other fleets. It is not telegraphed and exists on every difficulty level. After playing around three – to the four – hundred in-game days, that this battle can completely wipe a campaign is very aggravating, and the best possible strategy would be to simply know that this event will come in the future and plan far in advance. If you didn’t already realize, this is pretty much the exact opposite of a natural and enjoyable simulation. For some, these performance issues will be a bit too much to handle. While they didn’t entirely ruin my experience with Halcyon 6, I could see it being a problem for others. The addictive “one more turn” aspect of the gameplay was enough to get me hooked, as you are almost constantly making micro – and macro – management decisions in order to improve the efficiency of your dealings, as well as keep your galaxy safe. If it weren’t for these technical hurdles, I would go as far as to say that Halcyon 6 is a must-own for the Switch, but you’ll have to watch some gameplay in order to see if those hiccups are worth the entry price. Either way, I can’t recommend it enough, as long as you know what you’re getting yourself into.